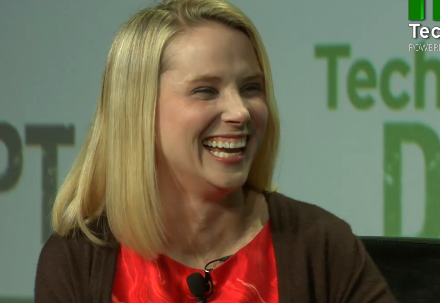 Yahoo now has 800 million monthly active users globally, according to CEO Marissa Mayer. That’s up 20 percent since last July, when she joined the company, and driven by 350 million monthly mobile users, as well as growth in traffic to the Yahoo homepage, search and core properties. It also doesn’t include the recent Yahoo acquisition Tumblr. The numbers Mayer disclosed seem to show a reversal of trends from earlier this year, though they’re not perfectly apples to apples, when comScore metrics showed declines in Yahoo’s U.S. homepage, mail and search traffic. But more recent comScore numbers had also shown Yahoo climbing above Google in U.S. Web traffic (not including mobile or Tumblr). Yahoo’s stock price has doubled during Mayer’s tenure, but in an interview at the TechCrunch Disrupt conference in San Francisco on Wednesday she gave credit to Jerry Yang’s Alibaba investment as well as Yahoo Japan for some of that bump. Mayer seemed to have a two-pronged approach to the session: Ample helpings of modesty and expectation-lowering, matched with boasty new numbers about progress. “It’ll take probably three or more years to really get growth to be going in the direction we want and the company to be going in the direction we want it to,” she said. So she brought some more numbers to prove progress on the first point. First, Yahoo is getting 12,000 resumes a week, five or six times what it used to; second, there’s three to four times less attrition; third, about 10 percent of Yahoo hires are “boomerangs” — people who previously worked at the company; and fourth, the mobile team has grown 10 times bigger since she joined. As for Yahoo’s somewhat silly new logo, which Mayer had proudly announced was revamped in a weekend, she downplayed critiques. “I like the way the logo turned out and I like the way we did it. We really pride ourselves at Yahoo in being the world’s largest startup.” She said the logo would continue to change in “small iterations,” especially given that it previously had 18 years of stasis.